Since the 1940s, the United States government has created at least four secret government-funded programs designed to gather intel on UFOs and determine if they are a threat to national security. Several other countries have followed suit as well including Australia, Brazil, Canada, Chile, France, New Zealand, Spain, Sweden, and the United Kingdom. So it’s no secret that UFOs have been a serious concern for governments across the world for decades. And if you think UFOs are just a thing of the past — The New York Times revealed in December of 2017 that the United States spent 22 million dollars between 2007 and 2012 on a secret government program called the “Advanced Aerospace Threat Identification Program”, making it the 4th secret US government project designed specifically to study UFOs. With all that studying going on, perhaps there is something to the UFO phenomenon. However, it is worth noting that an unidentified flying object is just that —unidentified. In fact, here is a list of 10 UFO sightings that baffled credible observers but were later identified. This article is some of the most well documented UFO events in recent history that still remain a mystery, with a special thank you to Leslie Kean for her book, UFOs Generals, Pilots, and Government Officials Go On The Record, where much of this information has been sourced from. Considered to be the Roswell of the UK, it is safe to say something extremely strange happened on the early morning following Christmas day in Rendlesham Forest, just outside the RAF Bentwaters / Woodbridge complex in England. The book UFOs Generals, Pilots, and Government Officials Go On The Record documents Sergeant James Penniston account of what happened, who at the time, held a top-secret U.S. and NATO security clearance. Shortly after midnight on December 26th, Penniston was briefed that some lights had been seen in Rendlesham Forest. He then ordered Airman First Class Edward Cabansag and Airman First Class John F. Burroughs to respond with him. After determining the object did not appear to present a threat, Penniston was able to complete a thorough on-site investigation, including photos and notebook entries. He was even able to touch the craft. To the great surprise of Colonel Charles Halt, deputy base commander of RAF Bentwaters, the object returned on December 27th, allowing himself and four other military personnel to observe and record the object. A formal report was filed of the incident but an official explanation was never provided. The suggestion from the government at the time was that the witnesses were seeing light from a nearby lighthouse. However, in 2015, the BBC reported that Col Halt gathered written statements from radar operators at RAF Bentwaters and nearby Wattisham airfield that the unknown object was tracked on radar. He mentioned that some former service people did not want to speak until after they retired but have now provided written statements to him. “I have confirmation that (Bentwaters radar operators)… saw the object go across the scope of their 60 mile (96Km) scope in two or three seconds, thousands of miles an hour, he came back across their scope again, stopped near the water tower, they watched it and observed it go into the forest where we were,” said Col Halt. On November 7th, 1986, a Japanese 747 cargo jet with a pilot, copilot, and flight engineer were flying from Iceland to Anchorage just after 5 pm when they all saw a gigantic, round object, much larger than their cargo jet with colored lights flashing around it. Captain Kenju Terauchi, a pilot for 29 years, also saw two smaller objects but described the largest “spaceship” — as he called it — to be at least the size of an aircraft carrier because he had it on his radar which provided range marks. The object proceeded to fly level with the 747 until it suddenly approached very close. Following the directives of the Federal Aviation Administration (FAA), Terachi dropped his jet 4,000 feet and even made a 360-degree turn to avoid the objects, but they continued to follow, even appearing in front of his cockpit. The largest object was captured on three separate radars, between the FAA, Air Force, and in the radar screen in the cockpit of JAL flight 1628. Captain Terauchi said all three objects followed his jet for 400 miles and the FAA flight control reports confirm that the object followed JAL Flight 1628 for at least 32 minutes. At one point, the object was seen on radar to be as close as five miles to the jet. “This event never happened; we were never here. We’re confiscating all this data, and you are all sworn to secrecy.” Like any sane person would, Callahan asked what the CIA officers thought it was, and he was told it was a UFO, and that “If we were to tell the American public there are UFOs, they would panic”. Throughout 1989 and 1991, extraordinary UFOs were observed above Belgium — resulting in a two-year span of active UFO reports which are now referred to as “The Belgium Wave”. Of the 2,000 reported cases registered during this time, 650 were investigated and more than 500 remain unexplained. It all started when two federal policemen were patrolling a road between Eupen and the German border on November 29th, 1989, where they reported seeing a field lit with such intense light that they could read a newspaper in their car. They also observed a triangular object with a red light in the center and three major spotlights on the corners which hovered silently. Over the next two hours, the policemen observed two more craft of similar description around the town of Eupen and witnessed red light beams emitting from a craft and retracting. Hundreds of civilians also reported seeing the same objects and radar registrations from that night were analyzed by Major General Wilfried De Brouwer, which implied that “the reported objects committed an infraction against the existing aviation rules.” 13 total policemen saw the objects and seventy official reports were fully investigated — none of which could be explained by conventional flight technology. The U.S. embassy also confirmed that they were not flying any experimental aircraft in the area that night. Surprisingly, the reports didn’t stop that night either. After this event on November 29th, four more sightings of similar craft were reported on December 1st and on December 11th, twenty-one witnesses reported seeing a triangular craft, one of which was captured on color slides and analyzed by two members of the French national space research center CNES, and a former senior scientist with NASA. The slides were determined to be untampered with and showed a craft moving slowly with what appeared to be a magnetic field around it. Imagine its November 7th, 1990, and you’re swimming in a rooftop pool at the Montreal Hotel. You look up and see a round, metallic object projecting bright light beams. Naturally, you might tell the lifeguard — as a woman in this particular situation did. The lifeguard then called the hotel security guard, who called the police and a journalist from La Presse newspaper. After they arrived to observe the object, the Royal Canadian Mounted Police, the military, and even NASA were called to record this sighting that lasted almost three hours, from 7:20 pm to 10:10 pm, making this UFO event one of the most remarkable and well documented. Although some skeptics say it was the Northern Lights, Montreal UFO researcher Bernard Guenette and former NASA scientist Richard Haines produced a 25-page report on the incident which concluded that “the evidence for the existence of a highly unusual, hovering, silent, large object is indisputable.” The object that caused the lights was estimated to be around 540 meters wide (1770 feet) but no official explanation has ever been provided. This case appeared on “Northern Mysteries” in 2006, a Canadian documentary series. On March 13th, 1997, what is considered to be one of the largest — if not the largest — UFO sightings ever recorded, occurred over Phoenix, Arizona. “Hundreds of people reported an enormous object, or objects, in the night sky”, reported USA Today, in June of 1997. A little after 8 pm on that night in March, the National UFO Reporting Center in Seattle, Washington received a call from a retired police officer in Paulden, 60 miles north of Phoenix, to report a cluster of 5 red lights in the sky heading south. A couple of minutes later, another call came in from the city of Prescott, 15 miles south of Paulden. Only a minute later, phones rang off the hook with calls from Phoenix and surrounding cities, with reports of an enormous V-shaped object with 7 lights. “In 1997, during my second term as governor of Arizona, I saw something that defied logic and challenged my reality. I witnessed a massive delta-shaped, craft silently navigate over Squaw Peak, a mountain range in Phoenix, Arizona. It was truly breathtaking. I was absolutely stunned because I was turning to the west looking for the distant Phoenix Lights. Not too long after calendars entered a new millennium, the town of Highland, Illinois was quickly distracted by a UFO that was seen in three different counties by residents as well as police officers. One of the first people to see the object was local business owner Melvin Noll, who was standing outside of his miniature golf-course in Highland around 4 am on January 5th, when he saw a curious light in the sky that he originally thought was a bright star. It then descended from the sky and that is when he realized it was definitely something else. “To me, it looked like a two-story house. It was the size of a football field,” Noll said. “It was two different floors. It had big windows — three on the lower deck and three on the top deck. Way up on top, there was like a penthouse with a dim light in it. Underneath, it had red lights in a diamond shape,” Noll said. Noll mentioned that it flew so close to him that “if somebody had looked out one of the windows, I could have seen it.” No one did, however, Noll did not see any wings or engine on the craft and noted that it moved silently. Once the craft came to a halt in the air, “that is when it scared me,” Noll said. It then continued slowly to the Southwest toward Lebanon, Illinois, at which point Noll went straight to Highland Police Department to file a report. Although Noll was concerned that the police wouldn’t take him seriously; they did, and his sighting was quickly confirmed by Craig Stevens of the Millstadt Police Department who was tracking the object that morning and described it as “kind of V-shaped”. Soon, area police officers in Lebanon, Shiloh, Millstadt, and Dupo saw the object too. Ultimately, police dispatch did contact Scott Air Force Base that night about the object, but officials said they knew nothing about it and no official investigation was ever conducted. The story was picked up by media across the country and was featured on a variety of television programs including The History Channel and National Geographic. Singer-songwriter Sufjan Stevens even wrote a song about it called “Concerning the UFO Sighting Near Highland Illinois”. In November of 2004, a guided missile cruiser called USS Princeton had been tracking mysterious aircraft intermittently for two weeks off the coast of California near Catalina Island. Navy Chief Petty Officer, Kevin Day, who was stationed on the Princeton, stated that he noticed radar traces of eight to ten objects in a loose formation, 28,000 feet in the air and in the direct vicinity of Catalina Island. In an interview with George Knapp, on Coast to Coast AM, officer Day said he was startled by their slow speed of 100 knots, but his sightings were confirmed on radar by other vessels in the area. 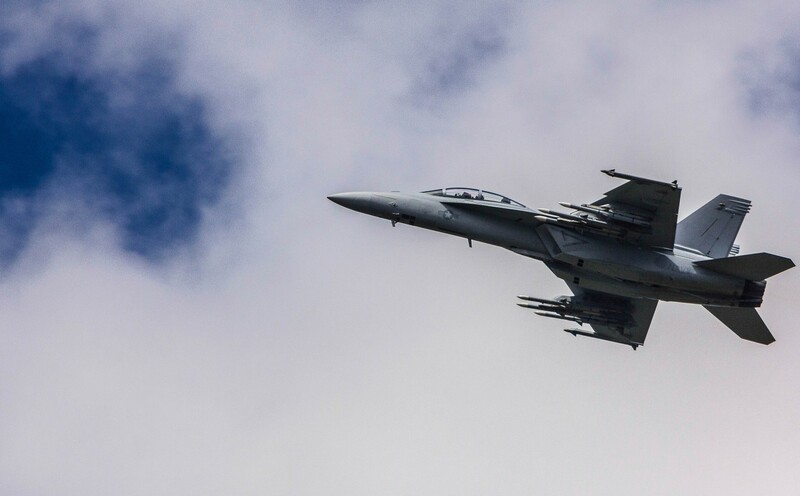 When the objects were spotted again a few days later, an officer on the Princeton contacted two U.S. Navy F/A-18 Super Hornet fighter jets from the USS Nimitz that were flying a combat exercise at the time. The pilots were instructed to change their course to investigate the unidentified radar spots. When the pilots arrived at the target site, they did not see anything or observe anything on radar, at which point the Princeton’s radar observed that the objects dropped from 28,000 ft to near sea level in less than a second. The pilots then looked down and observed churning water and frothy waves as if the waves were breaking over an object below the surface. A few seconds later, they observed an unusual object with erratic movements above the churning water. Lead Super Hornet pilot, Commander David Fravor, described the object as a large, bright, white, Tic Tac, 30 to 46 feet long with no windshield, no wings, and no visible engine or exhaust. After he began a circular descent toward the object, it began to ascend almost as if to meet him half-way. Commander Fravor then plunged toward the object in an aggressive maneuver, at which point the UFO accelerated out of sight in less than two seconds, leaving the pilots feeling “pretty weirded out”. Following this encounter, the Princeton reported that the object reappeared on radar 60 miles away from the new rendezvous point of the fighter jets, which would have required the object to travel over 2,400 miles an hour to cover that distance in the reported time. After the pilots returned to the Nimitz, a second team of F/A-18 Super Hornets took off with an advanced infrared camera and captured an object on video. This video was later released in the bombshell report from the New York Times in December of 2017 titled “Glowing Auras and ‘Black Money’: The Pentagon’s Mysterious U.F.O Program”, which showed an unidentified flying object flying at high speed and apparently rotating without any visible wings or exhaust. No official explanation has been provided. On November 7th, 2006, a disc-shaped object was seen hovering over the United Airlines terminal at the Chicago O’Hare airport for about five minutes before rocketing into the sky leaving a hole in the clouds. A United Airlines ramp worker was one of the first to notice the object around 4:30 pm and a pilot quickly made a call over in-bound ground radio for all grounded planes once he observed the object hovering at around 1,500 feet above the ground. Some witnesses believed it was rotating while others didn’t, but one thing they did agree on was that the object was silent and it was definitely there. Pilots waiting for takeoff could also see the object from their windows which looked roughly the size of a quarter or half-dollar at arm’s length — making it roughly 20 to 80 feet in diameter. The FAA and United Airlines first denied having any information about the incident, until a tape of the United supervisor’s call to the air traffic control tower was released after a Freedom of Information Request. This story broke on the front page of The Chicago Tribune on January 1st, 2007, two months after the event, and quickly became the Tribune’s most read piece in the entire history of the newspaper’s website with over a million hits. Since the UFO wasn’t captured on radar, the FAA decided it was a weather phenomenon and declined to investigate. One of the original news reports on the event can be watched on YouTube. In early January of 2008, just after 6 pm, over thirty people in the Stephenville, Texas area were taken aback when around sunset, they witnessed an object a mile long and half-mile wide, flying low and fast with very intense bright lights, but making no sound. One particular witness was Claudette Odom, who was clearing brush near her house with her husband and two friends. Being on top of a hill, they had visibility of twenty miles in every direction. Claudette described watching the object in wonder as it approached Stephenville and then silently hovered outside of town. She then watched the lights shape into a massive arch, before forming a bright vertical line that split into two. As they were watching the object, they were startled by the explosive sound of two F-16s flying directly above them at low altitude toward the UFO. Meanwhile 50-year-old pilot Steve Allen was at a campfire with some friends when he saw the object which he stated was a mile long and a half mile wide. Allen said the object traveled at amazing speed and made no sound. Allen told ABC News. He also described the same arch shape which transformed into a vertical shape before the lights “turned into just fire and it was gone”. Adding more mystery to the situation, after the local Air Force base at Carswell Field near Fort Worth was contacted about the situation, they originally claimed they definitely did not have any fighter jets over Stephensville that night and suggested that the UFO witnesses may have just seen an optical illusion or two commercial airliners. Claudette Odom didn’t buy that response. “I don’t know what they were trying to cover up. We saw what we saw. I knew they were fighter jets,” she told NPR. Strangely, two weeks later, Air Force officials stated that they made a “communications error” and that they had numerous F-16s flying over Stephenville Texas on that evening. Local reporter Angelina Joiner who first broke the story to the Stephenville Empire-Tribune concluded that this only bolsters the witnesses stories, as they correctly identified the exact jets that were seen in the sky that evening. Just a few months after the bombshell New York Times report regarding the Pentagon’s secret Advanced Aviation Threat Identification Program, a new video was released by To The Stars Academy of Arts and Science (TTSA) titled “GO FAST”, which showed U.S. Navy pilots encountering a UFO over the Atlantic Ocean in 2015. TTSA is a private scientific and research group co-founded by Tom Delonge of the pop-punk band Blink-182, as well as Jim Semivan, former senior intelligence member of the CIA, and Dr. Hal Putoff, a NASA and Department of Defense (DoD) advisor. The video is a 35-second, authentic DoD video captured by an infrared camera aboard an F/A-18 fighter jet traveling at 25,000 feet. It should be noted that the videos released by TTSA include pilots that are some of the most credible observers of aircraft in the world. The Department of Defense declined to comment on the video. I’m a plant-based human, musician, writer, athlete, hippy, and nerd, just trying to enjoy as much life as I can while causing as little harm as possible.